Even if you run the Dribble Drive there are many reasons you might want to run two post players at the same time. You might have great size, or you might have two players who are not able to play on the perimeter, who you want to play together. Playing two post players doesn’t necessarily mean abandoning your Dribble Drive principles, however. On any entry into the post, when you have two post players, just continue using the principles of the Dribble Drive post player movement. 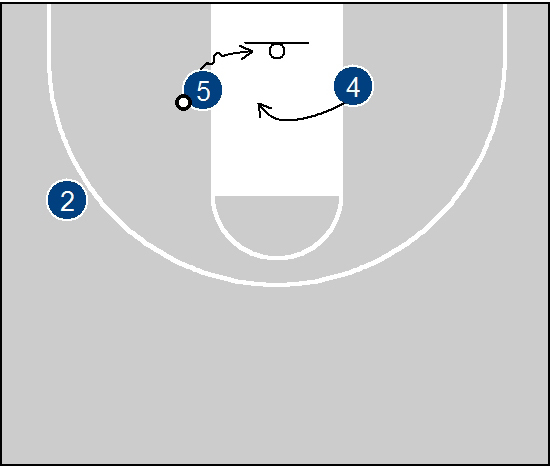 If O5 makes a move to the middle O4 relocates under the basket, just like a middle drive in the 4-out Dribble Drive. This will either draw X4 away from the help or leave O4 open under the basket. If O5 makes a move to the baseline O4 T’s up – just like on a baseline drive in the 4-out Dribble Drive. What are movements of the non penetrating guards? I think at times I’m going to have two posts in the game. Please help! Much like any other penetration – one finds the corner, the other finds the open window up top. Interestingly, 3 out, 2 in with dribble penetration emphasized looks a lot like coach knight’s (and coach Ks) motion offense zone attack. Same principles: penetrate the gaps and the inside guys flash to open areas….